On April 2, 2019, His Holiness Kirill, Patriarch of Moscow and All Russia, met with the Supreme Patriarch and Catholicos Karekin II of All Armenians, at the patriarchal residence in the St. Daniel Monastery in Moscow. Taking part in the meeting were also Metropolitan Hilarion of Volokolamsk, head of the Moscow Patriarchate department for external church relations (DECR), Archimandrite Philaret (Bulekov), DECR vice-chairman, Hieromonk Stephan (Igumnov), DECR secretary for inter-Christian relations, Rev. Alexander Volkov, head of the Patriarchal Press Service, and S. Aleferov, DECR staff member. The high guest was accompanied by Archbishop Ezra Nersesian, head of the Russian and Novo-Nakhichevan diocese of the Armenian Apostolic Church, Proto-Archimandrite Shage Ananian, head of the international relations department of the Holy Echmiadzin, Rev. Vagram Melikian, head of the Holy Echmiadzin press office, and Father Anania Tsaturian, secretary to the Patriarch. Patriarch Kirill expressed gratitude for the participation of a delegation of the Armenian Apostolic Church in the celebrations devoted to the 10th anniversary of the 2009 Local Council and for the congratulations on the anniversary of the patriarchal enthronement, noting that in the period since that time, the relations between the two Churches developed further and can be described as very positive. He also extended condolences upon the recent demise of the Armenian Patriarch of Constantinople Mesrob II, 64, who passed away on March 8 after a prolonged disease. 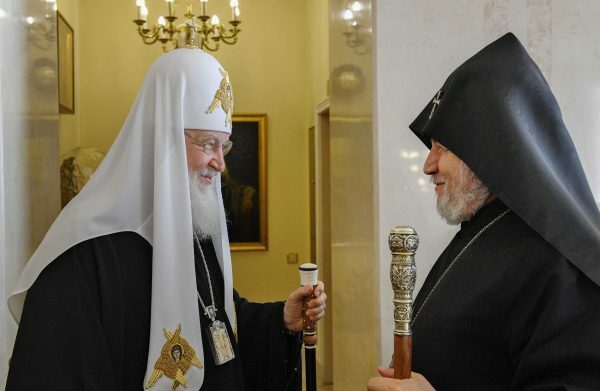 Speaking about the bilateral relations between the Russian Orthodox Church and the Armenian Apostolic Church, Patriarch Kirill stressed, ‘On the whole, I would like to say that there is nothing that would darken our relations. At the same time, life poses problems to be solved together’. Having mentioned the changes, which have taken place in the course of the elections to the Armenian state power, Patriarch Kirill expressed a hope for further preservation of the high level of church-state relations in Armenia and stressed that ‘The Armenian Apostolic Church plays an absolutely special role in the life of her people, in the development of culture. She also constitutes an important factor that ensures the high respect for the Armenian people throughout the world, including among the Russian people and in the Russian Orthodox Church’. His Holiness Kirill also dwelt on the situation in fraternal Ukraine. He stated that ‘the situation of the canonical Ukrainian Orthodox Church is not becoming better. It is astonishing that in a European country that has declared her commitment to the European option, human rights and religious freedoms are grossly violated in Europe’s full view. The canonical Ukrainian Orthodox Church is being discriminated today, and it is a perfectly obvious fact’. Patriarch Kirill reminded his guest that in Ukraine a united grouping has been artificially created out of two schismatic groupings, and it is not recognized by Local Orthodox Churches as canonical. ‘But unfortunately, the Patriarch of Constantinople has presented this grouping with an ‘autocephaly’, which he had no right to do because for 300 years Ukraine has been a member of the Russian Orthodox Church and nobody has the right to review history. If people so easily review history, if juridical and canonical documents defining this status are changed so easily, then what we are to expect is just chaos. It is a violation of every canon law and rule. Therefore, we are certainly defending the rights of the Ukrainian Orthodox Church and believe that the rights of the faithful should be protected’. The faithful should not come under a threat that their churches will be captured, Patriarch Kirill said, However, as he reminded, today there are already nearly sixty cases of forcible capture of church buildings in Ukraine. ‘It is very important that nobody should encroach on the shrines very important for entire Russian Orthodoxy, for both Ukrainians and Russians, for every nation and people who are members of our Church. And the securing of order in these holy places and of the rights of the faithful of the canonical Ukrainian Orthodox Church is an indispensable condition in talks about respect for the rights and freedoms of the faithful in Ukraine’. He expressed concern over the proposals made by radical Ukrainian politicians concerning the capture and consequent transfer of churches and monasteries to non-canonical entities. Constantinople’s interference has failed to consolidate the unity of Ukrainian Orthodoxy, to solve a single problem but rather created new ones, Patriarch Kirill said, also noting that ‘these problems concern not only Ukraine and Ukrainian believers who suffer from the present situation, but, unfortunately, also our entire Orthodox family. Problems have arisen only to weaken the pan-Orthodox unity. We are saddened by this, but we were not the initiators of the development of these negative circumstances’. His Holiness Kirill also underscored the importance of the presence of an Armenian community belonging to the Armenian Apostolic Church in the territory of the Russian Federation. ‘This community has the same legal rights as any other religious organization including the Russian Orthodox Church, and all the opportunities. Thus the real equality of people belonging to various religious organizations and present in territory of the Russian Federation is ensured. We highly appreciate this fact and believe it to be a condition for developing a normal religious life, including for the Armenian community’, he said. On his part, His Holiness Karekin II extended cordial congratulations to Patriarch Kirill on the occasion of the 10th anniversary of his election to the Moscow patriarchal throne, ‘We are delighted to be in Moscow again and to meet with you so that we may express to you our fraternal wishes of many years in good health and long and fruitful patriarchal ministry’, the high guest said, ‘Our heartfelt prayer is that the Most High God, by His blessing and care, may preserve you, all the clergy of the Russian Orthodox Church and the devout fraternal Russian people’. The Catholicos also said, ‘In the years of your patriarchal ministry, by God’s mercy, there were significant achievements and accomplishments in the mission of preaching, in the sphere of construction of churches, in the educational, social and many other spheres. In Your Holiness’s mission, the first place is occupied by efforts for strengthening the cooperation between nations, Churches, and religions. ‘It is gratifying to see the good fruits brought forth by the relations established between the Russian Federation authorities and the Russian Orthodox Church. These fruits promote the progress and prosperity of the ecclesial and social life of the devout Russian people’, Patriarch Karekin II said. The Patriarch-Catholicos mentioned with satisfaction the age-old fraternal relations between the two nations, noting that they are strengthened by cooperation between the two states and developing relationships between the Moscow Patriarchate and the Armenian Apostolic Church. His Holiness Karekin II reiterated the fact that His Holiness Kirill invariably stands for the preservation of spiritual and moral values and for their assertion in the life of state and society, and said, ‘In this respect, we are glad to point out to the ever greater consolidation of cooperation between the Oriental Churches and the Local Orthodox Churches and their joint efforts in dealing with divergent social issues, especially taking into account the excellent and promising examples of mutual cooperation between our Churches in the complex context of the Middle East’. It was with warm-hearted satisfaction and gratitude that the head of the Armenian Apostolic Church spoke of the important role that His Holiness Patriarch Kirill of Moscow and All Russia played in organizing three-partite meetings of religious leaders with the aim to promote a peaceful resolution of the conflict in Nagorno Karabakh. ‘Only a peaceful settlement of the Karabakh conflict is essential for the preservation of peace and stability in the region’, he stressed, ‘In solving the problem, the task of paramount importance is to establish an atmosphere conductive of peace through, among other things, activities for strengthening mutual confidence and reducing militant rhetoric’. The primates also discussed a number of pressing problems involved in the work of the Russian Orthodox Church in the Republic of Armenia. In conclusion of the talk, the sides exchanged tokens of the meeting.